These are my weekend wire wrap necklace projects. These are similar to the Green Themed Necklace in my previous posts. Only now there are four other colors - red, yellow/light brown and purple (didn't manage to take photo of the blue one). My favorite is the yellow/light brown one. 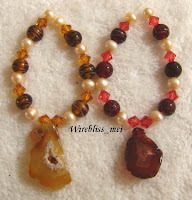 This one will be paired with an agate pendant. 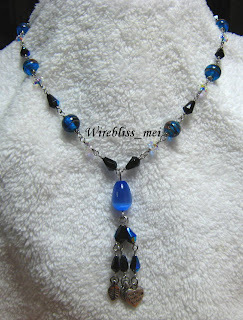 Here is the completed blue themed necklace.